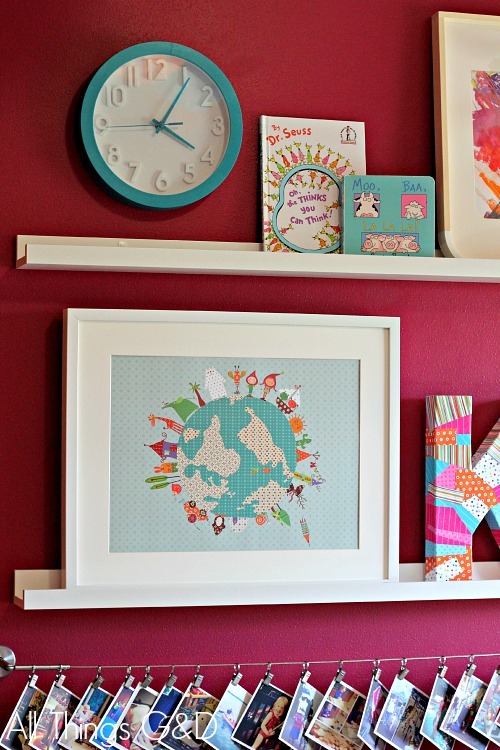 There’s been more fun than just coloring and sticker craziness happening in Kate’s nursery-turned-playroom lately! The latest addition to the space is this personalized art and photo display wall. 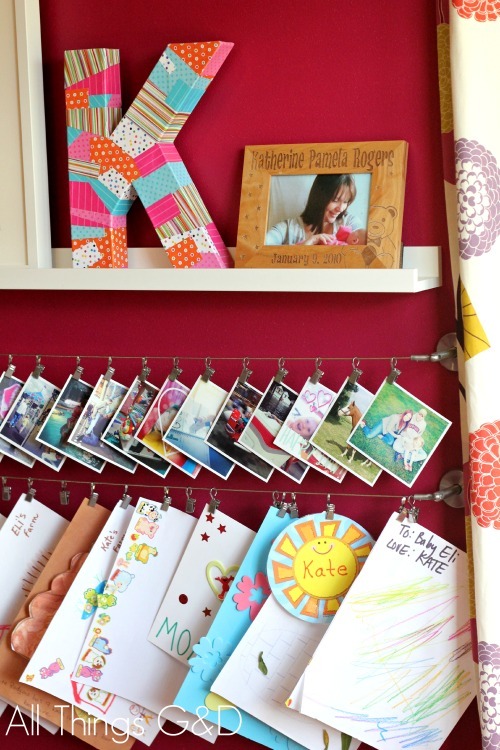 Read on for all the DIY details! 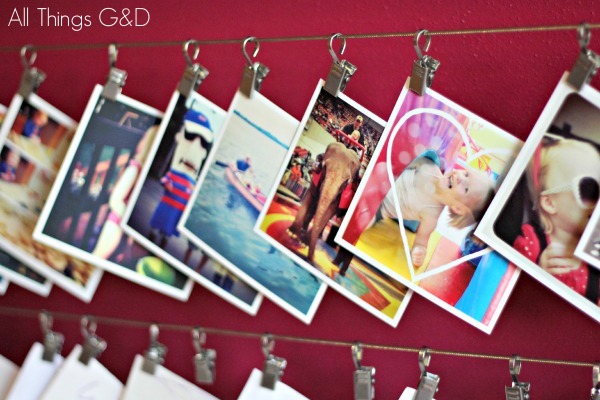 Personalized playroom art & photo wall display. On the upper right side I framed one of Kate’s paintings. Below that is the “K” I decoupaged for her first birthday party, and a personalized picture frame that G gave me when Kate was born, which holds one of our first photographs together. Kate’s art display in the kitchen has been such a hit that I knew I needed to duplicate it in her playroom to hold even more paper creations! Once again I used IKEA’s Dignitet curtain wires and Riktig curtain clips, stringing two lines just below the shelves. 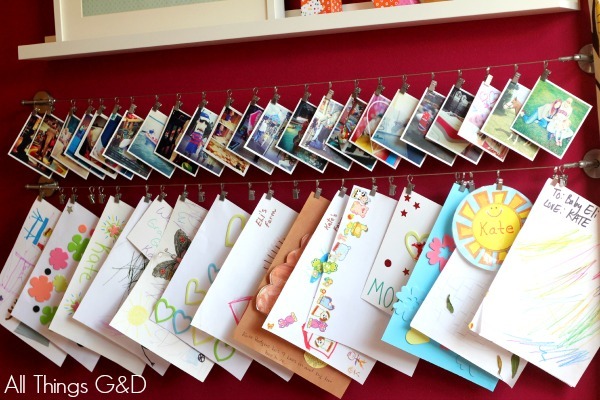 Kate loves making her own art creations, but she’s also equally obsessed with photographs! At any given time there is at least one photograph of her as a baby or a family picture of the three of us when she was little floating around in Kate’s backpack, her cubby at daycare, on her nightstand, or propped up in her dollhouse. It’s been quite a while since I’ve actually had pictures printed, so I decided to surprise Kate by getting a fresh batch of prints for her to enjoy! Lately most of our photos are taken with my iPhone and uploaded to Instagram, so instead of going with traditional 4×6″ prints, I decided to have some of our favorite Instagram pictures printed out onto 4×4″ cardstock by a company called Printstagram (read more about them in my latest “Things Loved” post). 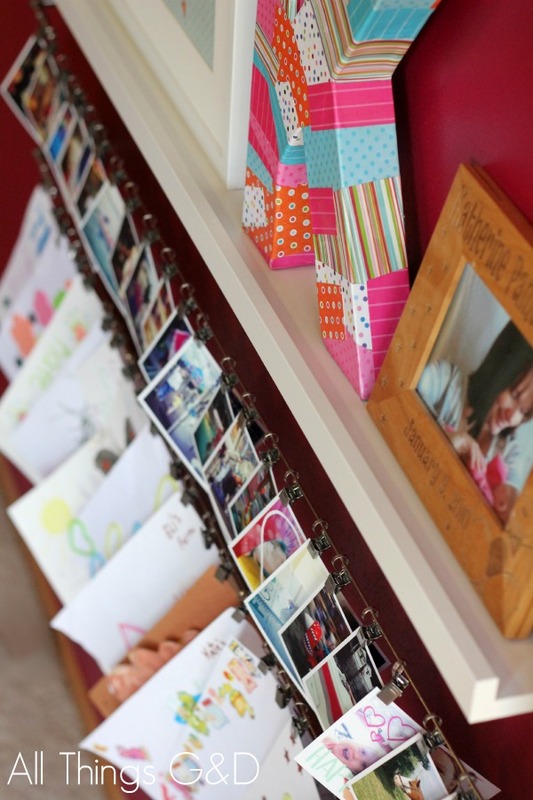 This little collection of 4×4″ prints was the perfect finishing touch for this personalized display wall – and with the clips we can easily change them out to update them with new favorites whenever we like! A close-up of our Printstagram prints. Still lots more to come! This is adorable! 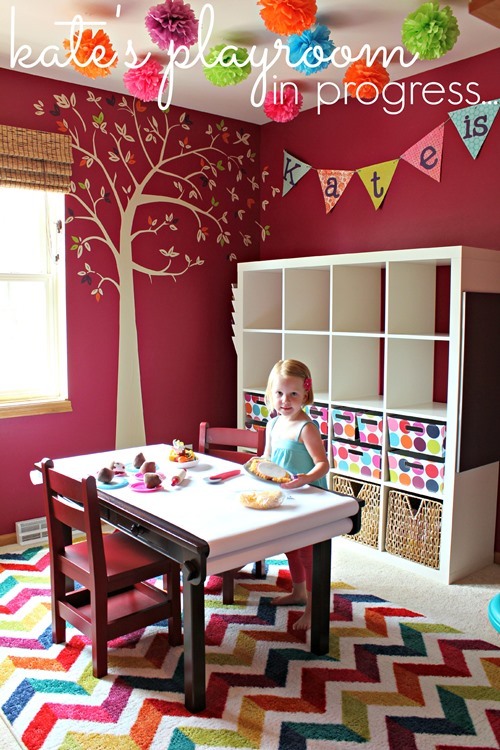 Kate is such a cutie and must be very well behaved that she doesn’t tear those papers down, which is amazing. Well done you! 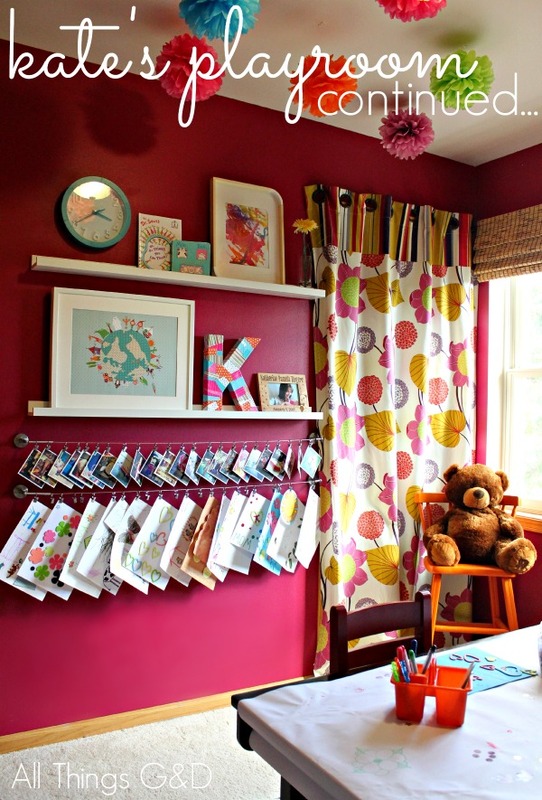 I love all the colors in her playroom! That rug makes me want to dance. I also want to run out and make a decoupaged letter for myself, love it! Thank you so much, Melinda! I got that rug from Mohawk and we love it so much. I smile every time I see it! Thanks Meghan! Go for it! The quality of the prints is great and their shipping is super fast. Kate loves switching out her pictures and its fun to relive all these fun family moments! This is so cute! What a great space! Do you spend lots of time there? I wouldn’t want to leave, so I’d imagine Kate doesn’t want to, either. Everything looks so cute! I saw your Tile Shop ad today! It was in Kansas City Homes & Gardens magazine. Oh how fun! Thanks for mentioning it, Trish! LOL! Thank you so much for the catch, Vickie! We probably wouldve never caught that, hahaha. Hope your friend likes her gift! It’s so pretty. 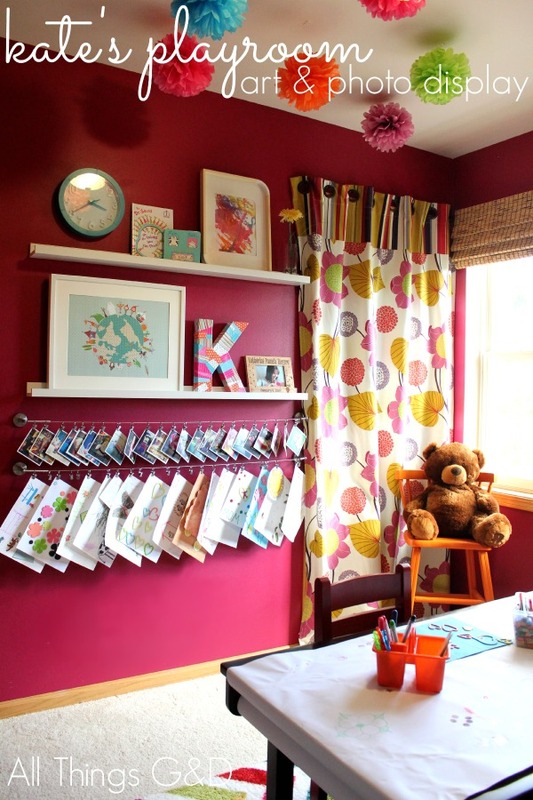 A little girl’s dream room. 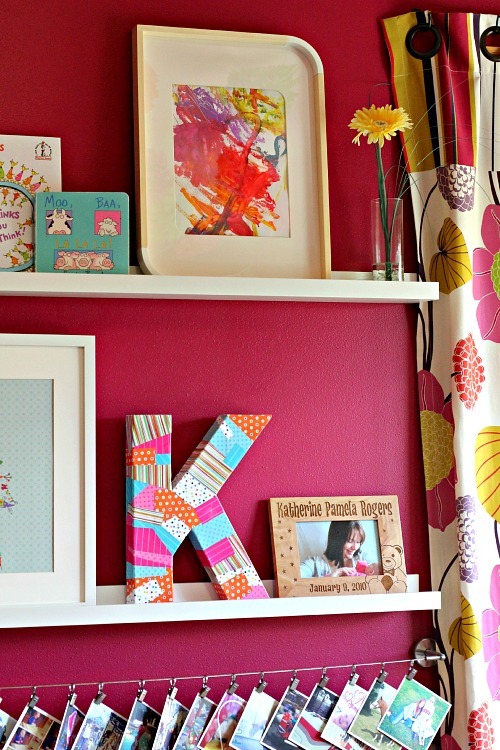 I love the mix of colors and textures in there and all that personalized art. So sweet. Thank you, Jana! I always used to keep things fairly neutral, but oh how children change that! Now I embrace all those fun and playful colors. 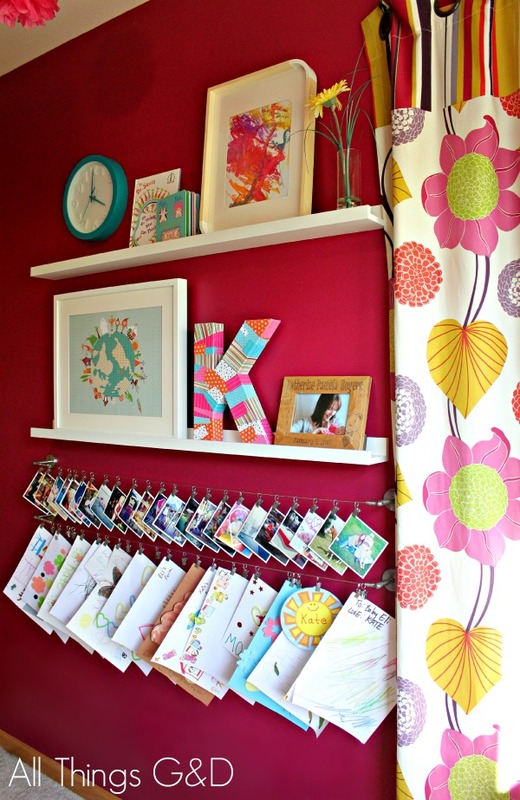 never thought of displacing kids art work like that! Your daughter is too precious! I love this room. Do you mind sharing what paint color you used? Thank you, Amanda! The paint color is Raspberry Pudding by Behr. This is just crazy CUTE!! Hello, where did you get the cabbie storage bins? Very cute and colorful!